There’s a story about seeking happiness that goes like this. A dog has an epiphany that happiness lies in its tail. So it begins an endless quest, moving in circles, chasing its tail but never quite catching up. Frustrated, the dog seeks out a seer among dogs, known to be forever happy and content, and pours his heart out. The wise old dog then tells him the epiphany was right – indeed, happiness lies in one’s tail – but that it takes ages to figure out that chasing one’s tail is no way to be happy. All one needs to do is go about one’s business, doing what needs to be done, and the tail follows, bringing joy. READ: What exactly does MP's department of happiness do? Happiness, even as an individual pursuit, is a greased phantom, forever out of grasp. So how do governments, not known to work efficiently to bring to people the most simple and tangible benefits such as bijli, sadak, paani, go about making people happy? Is that at all a goal governments must chase? Since 2012, the United Nations Sustainable Development Solutions Network has been publishing a World Happiness Report, the biggest survey of levels of satisfaction with life and absence of misery in the nations of the world. The idea was debated at a UN high-level meeting chaired by the prime minister of Bhutan, which for long has preferred Gross National Happiness over GDP as an index of growth. The annual reports have predictably seen the Scandinavian countries, besides some small European nations and Canada, consistently among the top nations whose people report the maximum level of satisfaction with life. And predictably enough, some poor African nations, some dictatorships, and strife-torn Syria tended towards the bottom of the rankings. So, as a sceptic would ask, is there anything new? Prosperity, a good social support system (that doesn’t mean just doles), and access to education and healthcare clearly contribute to a happier citizenry. And yet there are surprises that make one wonder if such rankings mean anything at all: a basket-case economy like Pakistan and a dictator-led Turkmenistan rank higher than India. One might reasonably conclude that (ignoring the surprises) such rankings best serve to spur the aspirations of countries in the middle ranks. Especially if they are vibrant democracies like India, whose youthful, creative and entrepreneurial energies are being channeled towards economic growth. As democracies, it is imperative that countries like India work toward becoming societies which foster equitable distribution of wealth and basic amenities. Perfect equality is unattainable; pragmatism dictates that governments work to ensure that, however poor a person may be, she and her children have their basic needs taken care of, have access to high quality education and healthcare, and have a robust safety net for old age. The slow but steady democratisation of knowledge that the internet and related technologies are bringing about, along with access to the government and the means to interrogate it, are encouraging movement in this direction. Technology, driven by business, will be the vehicle of change; what we will need is governments with the heart to steer that vehicle towards the utilitarian ethic of the greatest good for the greatest numbers. The six predictors the World Happiness Report uses to assess happiness levels in the nations of the world are decent enough guidelines to government action. They are: GDP per capita; healthy life expectancy; social support; freedom to make life choices; generosity; and perceptions of corruption in government and business. In addition, people are surveyed for how happy they are, how much enjoyment or laughter they experience, as also for how miserable, depressed or hopeless they feel. One might argue with interpretations of certain headings such as social support (which the report links to support from friends and family rather than government) or GDP per capita (which might mean little in heavily skewed socio-economic set-ups such as India’s), or whether generosity is linked to happiness at all. But broadly, these factors are usable. Governments might more productively create happiness among citizens by encouraging vigorous economic progress and harnessing it to equitable distribution, by attending to the basic needs of the poorest sections, by ensuring that freedom and human dignity are not in any way curtailed, by eliminating corruption and crony capitalism, and by making good education and healthcare cheaply accessible throughout life. In short, governments and leaders should go about their business of good governance, consciously cultivating a sensitivity to the needs of the worse-off sections and gearing policy to reach them – rather than chase happiness for the people as a goal per se. If the goal of happiness for the people could be thought of as the dog’s elusive tail, governments will find it following as they go about their jobs in earnest. 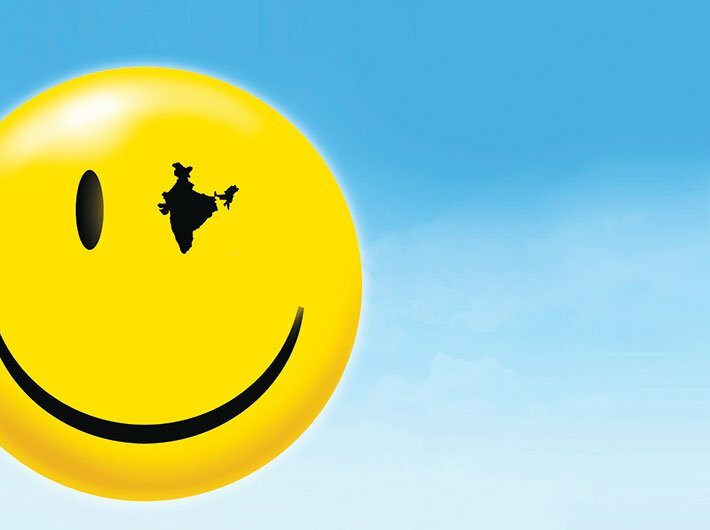 As India rides the world trend of making the happiness of citizens count – Madhya Pradesh was the first to set up an Anand Vibhag, and the Andhra Pradesh CM recently took charge of a happiness index portfolio – this issue of Governance Now takes a look at the questions involved. We have a report on Madhya Pradesh’s Anand Vibhag, a column on GNH pioneer Bhutan, and interviews on happiness with a spiritual expert and a secular economist.